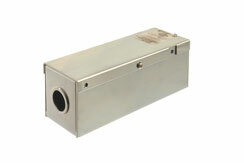 Safety & dust protection closure strip can be custom cut to fit spaces between plug-ins. For use in mounting busway (track) sections. Mounting hole will take 3/8" diameter bolt. Set can be attached to busway at any point. A minimum of two busway hangers required for each 10 foot busway section. For mounting straight track sections. Mounting hole will take 3/8" diameter bolt. They can be attached to straight track at any point between track joints. Not suitable for curved track sections. Item: Hanger. Note: Minimum of two track hangers required for each straight track section.. For: FRS100 & FRS200 Series (Feedrail®) Track.. For: FRS300 Series (Plug-In Service). 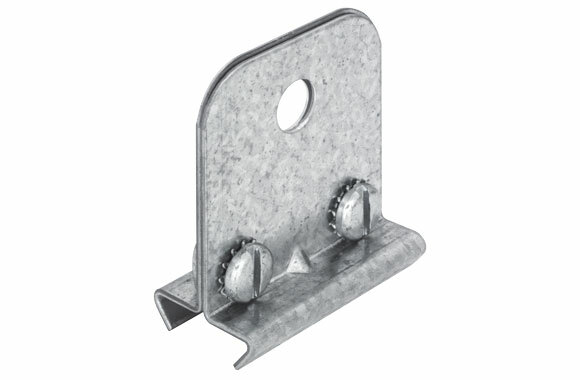 For use in Clevis or other hanging when 10 foot support spacing is desired. To be used at busway (track) joint over coupling set. For 10' support spacing to be used at track joint over coupling. Item: Duplex busway hanger set. For: FRS100 & FRS200 Series (Feedrail®) Track.. For: FRS300 Series (Plug-In Service). For Tie Rod Installations. Permits direct attachment of 3/8" tie rods at any point between busway (track) joints. Permits easy leveling of busway sections. Minimum of two busway hangers required for each section. 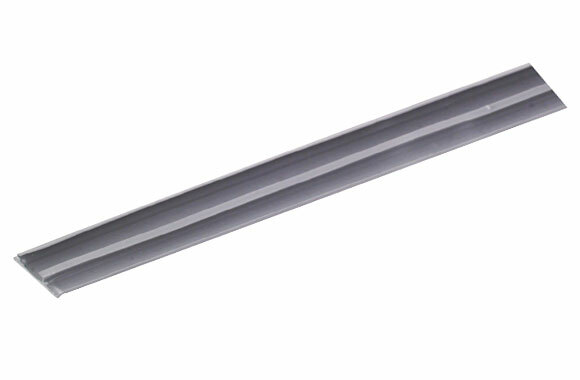 Allows direct attachment of 3/8" tie rods at any point between track joints. Permits easy leveling of track sections. When used with curved track, field notching of track top flange is required for clearance of clamping bolt. Item: Hanger (for tie rod). Note: Minimum of two track hangers required for each straight track section.. For: FRS100 & FRS200 Series (Feedrail®) Track.. For: FRS300 Series (Plug-In Service). For use in Tie Rod Installations. Malleable iron, with 3/8" cross bolt and 3/8-16 tapped hole for tie rod. 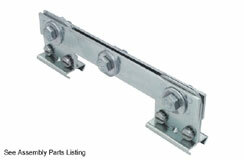 Used with ERS-105 Busway Hanger Set. 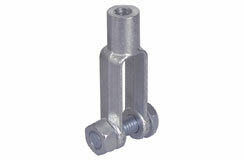 Clevis support for tie rod applications. Malleable iron, with 3/8" cross bolt and 3/8"-16 tapped hole for tie rod. Must be used in conjunction with FRS-124 and FRS-105 track hangers. 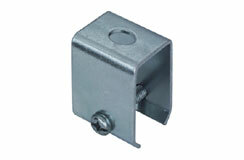 Item: Clevis support for tie rod installations.. For: FR100 Series (Feedrail(R) '100'). 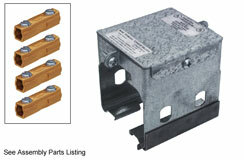 For: FRS100 & FRS200 Series (Feedrail®) Track.. For: FRS300 Series (Plug-In Service). For closing the end of a busway (track) run. 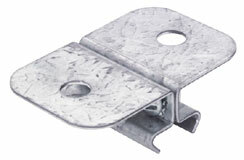 Consists of side plates, cover and bus bar connectors used to join track sections. One coupling is required for every two sections of track joined. Item: Coupling. For: FRS300 Series (Plug-In Service). Power: 50 Amperes. Poles: 4. For electrical connection to the power supply and closing the end of a busway (track) run. For connection to power supply at the end of track run. Serves as end cover. Concentric knockouts at end (1/2 or 3/4 conduit). Terminals included accomodate No. 14 to No. 6 strand wire. Item: End feed. Power: 50 Amperes. Poles: 4.